The little town of Kaga in Ishikawa prefecture used to be an old temple town which today is famous for not only its temples but also its onsen. 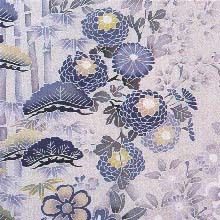 In the Edo period (1603-1868) a local printer and dyer, Yuzensai Miyazaki, worked on creating beautiful silk cloth with patterns and managed to perfect what became known as the Yuzen process. At the time this was particularly important for family crests, and during the Edo period a local clan was trying to develop this little town, this meant that dyers such as Yuzensai were lucky to enjoy the patronage of wealthy clan members in order to perfect their techniques. Kaga dyeing is basically the use of persimmon and the bark of plum trees to dye unpatterned cloth, while Kaga Yuzen is a process by which this cloth can have elaborate patterns and designs. Part of the charm of this craft is its amazing colours using five specific hues. One particular hue is famous in Japan for the fact that it was so widely used, indigo blue. The other hues are green, similar to the shade of plants, yellow like ochre, dark red and purple, these are used with gray for the basic colours. The designs themselves are only limited to human imagination, natural landscapes, plants and animals are popular motifs, and they are normally completed by a single artisan. This can take a long time to do, sometimes many months. As excess dye has to be removed the craftspeople washing their work in the rivers of Kaga became a common sight.